Post Office in India is becoming high tech today. Post office is not only medium of sending letters. You can avail multiple financial services at Post Offices. Government has already announced that post office will be converted to bank and it will be known as Post Bank of India. Today we will go through various financial services offered by Post office. Sending domestic money order using post is old story. Now you can send money to foreign country using post. This outward remittance money will be credited in to the bank account of beneficiaries in foreign country. Maximum limit of outward remittance is 5000 USD. Maximum 12 outwards remittances are allowed per year. This facility is known as MO Videsh. You can get details about this money remittance service here. You can purchase postal life insurance using post office. Premium of postal life insurance is very low compare to private insurance companies. Regular postal life insurance provides risk coverage from 20 thousand to 50 Lac. You may be surprised to hear those Post offices are also involved in selling mutual funds. Only few selected mutual funds schemes are available for investment through post office. Principal, SBI, UTI, Franklin Templeton and Reliance Mutual are some of them. Post office is providing this service in association with IDBI bank. For more information about Mutual Fund investment through post visit post office website. Some selected post office also offers ATM services. You can withdraw cash or carry out money transfer using this ATM services. Postal department is issuing separate ATM card to customer for this services. Postal department is planning to extend this facility to every city. You can also invest in small saving schemes using post office. NSC, MIS and Sukanya Samrriddhi Account are most popular small saving investment option offered by post office. Indian Post office is working on Reverse E-commerce platform. Using this model you can sell your products to other company via postal department. This means post office will act as seller for you. 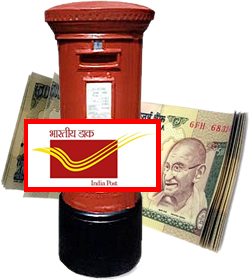 Indian post office will be converted in to payment bank by 2017, the government of India has in principally approved this proposal. This bank will act as payment bank means you can deposit money in this bank you can not avail loan facility. Indian Post office is also thinking to open common service center. You will be able to avail services like applying for Aadhar card, birth certificate, mutual funds investment etc. Post office services are not preferred by many people in India. Customer support and services extended by post are very poor in some part of India. You might have experienced that. So, Indian post office has long way to go. Do share your experience about availing post office services. Whenever i think of Post offices, i think of a small room with the old 100watt bulb and i still imagine a long line of elderly people waiting endlessly to carry out their tasks, especially during the month end. Filling up forms, affixing stamps using those glues available at the counters…this is still my image of a post office. And i am pretty sure it hasn’t changed much (at least this is the case in 3/4ths of their offices..i reckon). They can afford to remain like that since the Government of India is feeding this department at the expense of tax payer’s money (i believe this is the same). I am sure they stopped being profitable anymore. Their speed post is slower than the slowest private courier service.